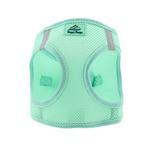 The American River Choke Free Mesh Dog Harness in Teal is sure to be your pet's favorite way of getting around the neighborhood in comfort and safety. This stylish harness is comfortable enough to wear around the house too! Posted On 12/14/18 by Susan G from Reading, PA Yes, Susan G recommends this product! Posted On 05/03/18 by Susan G from West Lawn, PA Yes, Susan G recommends this product! The color is actually more of an aqua mint than teal which is darker blue green, but it is a beautiful shade. We own several of these awesome harnesses and this shade will be great for spring and summer. Posted On 10/20/17 by Vicki H from , ID Yes, Vicki H recommends this product! This is the best fitting harness that Buddy, our Shih Tzu has ever worn. He can't slip out of it, like he's done with his previous harness. Buddy is a big boy & weighs 18 lbs, so the large size fits him well, not too large & not too small. Posted On 08/13/17 by Jacqueline O from Vero Beach, FL Yes, Jacqueline O recommends this product! Made beautifully. Easy to put on and the color is great. Love the color/style and I feel like this is safe and secure. Posted On 08/11/17 by Amanda K from Philadelphia, PA Yes, Amanda K recommends this product! I ordered this in a SMALL for my little peanut Penelope. We previously used back clip nylon harnesses but Penelope managed to get her legs through one hole and wiggle out without even trying so I started looking for something else that I would feel more comfortable with. I like that this is totally solid... she definitely can't get her little legs into one leg hole with this one. I make sure the Velcro is pressed together tightly and triple check the clip because I am paranoid. I just used this last night and I really felt comfortable like she wasn't going to get loose. The choke free aspect is also something I find important. I ordered a MEDIUM for our slightly bigger dog Piper and I tired it on Penelope to see what size she would be but it looked really loose on her. I think sizing is key. I also enjoy the color of this... it's really pretty. Posted On 08/04/17 by Arlene F from Richfield, OH Yes, Arlene F recommends this product! Posted On 07/07/17 by Mary A from Livonia, MI Yes, Mary A recommends this product! I have so many pink dresses and harnesses, I thought I would change it up a bit with Teal. The color is a warm aqua/teal and ideal for hot Michigan summers. She loves her walks and she knows that she looks good! Posted On 06/26/17 by John A from Brewster, MA Yes, John A recommends this product! Great Product, but runs slightly undersize, be aware!! I have to exchange the items because they are too big for our dog, but the items are otherwise perfect, so no complaints. I only downgraded for the customer support because the mobile website was difficult to use,and I was doing it on an iphone6 plus, pretty big screen, but it was still difficult. I am only providing this as feedback because your site is so determined to improve the customer experience, and I appreciate that. I was not aware of BaxterBoo before my purchase (just found online while looking for a coat) but I am now a customer. My dog and I are very happy to have found BB! Keep up the exceptional work.